Jee-Lar is an Argonian agent of Cyrodilic Collections who is first met in the Sunless Hollow, while assisting Concordia Mercius investigate Margus Derius and the Blackguards. He will provide a list of Argonians to check on and gather information from and will accompany you to Norg-Tzel to thwart Margus Derius' plans to eradicate Murkmire. After that, he will give all the repeatable quests to help Cyrodilic Collections prepare for more expeditions. He can also be found in Lilmoth within the Cyrodilic Collections headquarters. 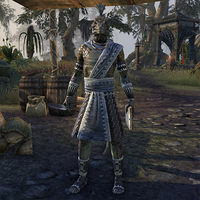 Jee-Lar has been part of the organization since the beginning with the Mercius sisters and has an interest in history which is very unusual for an Argonian from Murkmire. The Cursed Skull: Help Cyrodilic Collections locate the cursed skull of Beela-Kaar. Bug Off! : Collect ingredients to make bug repellent candles for expeditions to Murkmire. Reeling in Recruits: Help recruit new adventurers for Cyrodilic Collections' expeditions to Murkmire. Salty Meats: Help gather food supplies for Cyrodilic Collections latest Murkmire expedition. The Winds of Kyne: Supply accurate weather forecasts for Cyrodilic Collections' Murkmire expeditions. Jee-Lar will first be encountered in the Sunless Hollow after you collect the Argonian relics. Jee-Lar: "That doesn't belong to you!" "Answer quick! Are you a Blackguard or are you the friend Concordia sent me to assist?" I'm a friend of Concordia. I recovered these antiquities for Cyrodilic Collections. "Sounds like you didn't need Jee-Lar's help after all. Ah well. I'm not anxious to fight with these Blackguards anyway. I erect the spine of greeting, new friend of Jee-Lar. I am happy to meet you, and that's a fact!" How long have you worked for Cyrodilic Collections? "I have been with Concordia and her sister from the beginning! I left my home in Murkmire to help recover the stolen past of my people. And to participate in adventures. All very exciting! Head back to Concordia and I'll meet you there." "You should get back to Concordia with those items. I'll be right behind you!" Once you have you traveled back to Concordia, Jee-Lar will have gotten there before you. If you speak to him before handing the antiquities over, he will talk to you a bit about his interest in the past. "You were quick, though not as quick as Jee-Lar, and that's a fact!" I did have to carry these Argonian antiquities back with me. "And you should show them to Concordia, fast-fast! She's been waiting for you to return and wants to hear all about what you found in the Sunless Hollow." Are all Argonians from Murkmire interested in ancient Argonian history? "Not as many as you would expect. Most Argonians from Murkmire are more interested in the here and now. They believe that the past is dead and gone and best forgotten. Me? Oh, the past has always fascinated me. That's why I joined up with Concordia!" "I'm glad you've taken an interest in our cause. Concordia and Famia know the ruins. I know Murkmire's swamps and rivers. And you know how to get things done! The four of us will accomplish great-great things!" While in the Outlaw Refuge, Jee-Lar will come find you once you have finished looking for clues about the Blackguards' next step. Jee-Lar: "Over here, friend of Concordia!" "There you are! Was the smuggler able to tell you anything about those antiquities you found? Concordia certainly seems to think they might be important. I'm still learning to understand dryskin emotions, but I'm pretty sure she's concerned." Eshundir was murdered, but I learned that the antiquities are leading Margus to something important. That's a worry for later. Concordia sent me to help you right before she departed." "Concordia has a camp in Shadowfen, outside Stormhold. She went to check on things and do a little more research on the items you recovered. The murderer dropped a note. It says Margus is gathering the Blackguards at the Chid-Moska Ruins. "Chid-Moska? That's in Shadowfen and that's a fact! We should hurry if we want to stop Margus and the Blackguards! I can arrange transportation for us. Just tell me when you're ready to go." I'm not ready to go just yet. "All right. Do what you need to do. When you're ready, find me and we can travel to Shadowfen." Once you have arrived in Shadowfen, Jee-Lar can be asked about the Xal-Toh tablet and the legend he thinks is associated with it. "The ruins are up ahead. I'll wait here and make sure the boat stays safe. There are all kinds of horrible creatures in the swamp and some of them eat boats. That's a fact!" Before I enter the ruins, tell me about the Xal-Toh tablet and the legend you mentioned. "We, Xal-Toh, means "sacred secret." Each tablet contains its own mystery. I think this one is related to the legend of Beela-Kaar. He was an ancient Argonian sorcerer. Terrorized most of the Black Marsh, or so the story goes." What does an ancient sorcerer have to do with all this? "Not the sorcerer, but the relic he left behind. The legend claims that Beela-Kaar used his considerable arcane energy to imbue his skull with a powerful curse when he died. The process turned the skull into solid gold!" Do you think that's what they're after in the ruins? "That seems unlikely. The story I heard claims that the skull was hidden of the coast of the Black Marsh. Margus probably has the Blackguards looking for more clues that point to the skull's exact location. Be careful in there, my friend." After retrieving the Argonian Nightmare Idol, you can find Jee-Lar back at the boat. "You found something? And you made it out alive! You continue to surprise me, my friend. Hop in the boat and we'll head for Concordia's camp outside Stormhold." After showing Concordia the idol, she'll send you and Jee-Lar to ask the local Argonian experts what they know about the Cursed Skull. "The cursed skull scares the wind out my sails and that's a fact! Does Concordia have more work for us to do?" Concordia wants us to talk to local Argonians with knowledge of antiquities from Murkmire. "Why didn't I think of that? The Blackguards are sure to harass anyone they think can help them decipher the clues that lead to the cursed skull! I can think of five or six knowledgeable Argonians right here in Shadowfen!" How do we find these Argonians so we can check on them? "Here. You check on the Argonians on this list and I'll go check on a few others. Meet me back here after you're done and we can compare notes. Just be careful. If the Blackguards found them, there's a good chance they're keeping an eye on them." Once you have completed interviewing your list of Argonians, Jee-Lar can be spoken to about his findings and he also expresses shock at the situation for Argonians living outside Murkmire. "Life here is so very different from the way things work in Murkmire. I never realized how many Argonians have such a terrible existence. And now the Blackguards are just making things worse! Were you able to talk to the Argonians I suggested?" Yes. The Blackguards forced them to decipher a woodcut Margus found inside the nightmare idol. "The Argonians I talked to said the same thing. Apparently the woodcut describes some sort of ritual that will allow Margus to either find or retrieve the cursed skull. What did the Argonians you talked to have to say on the subject?" The ritual involves meditation cylinders and must be performed on an island called Norg-Tzel. "That's interesting. Very interesting! Those words mean "the forbidden place" in the language of Murkmire. I also learned that the Blackguards are preparing to launch an expedition to find this island so Margus can perform the ritual." The Argonians I spoke to said something similar. "We need to find that ship! One of the Argonians told me that only three Blackguards know the location, but as a precaution they each carry one-third of a map. They must work together to reach the ship. You will find two of them and I'll get the third." Once you find the map pieces and the location, Jee-Lar will be down there next to the boat. "Good, good, you're here! It looks like Margus has already departed for the island, but the Blackguards are preparing to send back-up. We need to sneak onto the expedition ship and use it to take us to Norg-Tzel. But we don't know where the island is located. "No, but the ship's pilot knows the way! We just need to board that vessel and convince the pilot to help us. I doubt the Blackguards inspire much loyalty in their hirelings." All right. Let's go convince the ship's pilot to take us to Norg-Tzel. Jee-Lar: "That's an Argonian reliquary! It must have contained one of the cylinders for the ritual!" Jee-Lar: "Anoter Argonian reliquary! From the looks of it, it was dug up fairly recently." Jee-Lar: "That's a bog-blight! Please be careful-careful, my friend!" Jee-Lar: "Another Argonian reliquary. Margus may have enough cylinders to conduct the ritual now." Jee-Lar: "A xanmeer! That's the perfect place for Margus to perform hisn ritual." "We should enter the xanmeer and stop Margus before he unleashes the curse of Beela-Kaar!" When you enter the xanmeer it becomes clear that Margus has already begun the ritual. Jee-Lar: "Quick-quick! Margus has started the ritual!" "You need to stop that ritual and that's a fact!" He can be spoken to at this point to ask for his advice on what to do once you reach the ritual chamber. "See those pedestals down there? How the cylinders taken from the reliquaries are set upon them? Margus is using them to focus his ritual! You might be able to disrupt the ritual if you turn the cylinders so they recede into the pedestals." Jee-Lar: "Disengage the cylinders! That should stop the ritual!" "I need to maintain my concentration!" Jee-Lar: "Look-look! Killing those monster grants access to the ritual cylinders!" Jee-Lar: "Each cylinder you disengage stops another part of the ritual. I think." Jee-Lar: "That did it! One more cylinder and the rest of the energy should dissipate." Jee-Lar: "That chamber, there it is! Deal with the guardian and grab the skull!" "Go on, go on. Fast-fast! I'll meet you on the ship." When the skull has been given to Concordia she will mention that Jee-Lar is having trouble get things ready for their next expedition to Murkmire. "Oh good-good! I hoped our paths would cross again, and here you are. Want to help Cyrodilic Collections again? We need assistance with our next expedition to Murkmire. Things aren't going smoothly as planned." "This venture grows bigger and bigger! It's a tough beast to wrangle. Could you lend Jee-Lar a hand today?" "The sooner you finish that task the better, my friend." "Please be swift-swift, my friend. Our expedition depends on your help!" "Something else? Or do you need a reminder?" "Ever since our expedition started, I am always so busy-busy! Thank you for the help." "Have you finished that errand I gave you? It would be most welcome-welcome news." "Welcome back, my friend. Did your search yield fruit?" "You return! Was your task a success?" "We are like a nest of giant bog ants. Coming and going and coming again. Have you brought something to our hill today?" "Cyrodilic Collections is most grateful for your help with our expedition. Most grateful!" "As always, a pleasure to work with you, my friend." "If there were two—perhaps three—more of you, this expedition might not me necessary at all!" "There's always something more to do. Jee-Lar only needs to discover where to concentrate next." Tell me more about your work with the expedition. "It is Cyrodilic Collections' mission to find a restore the relics of Murkmire for all of us to enjoy. However, our expedition has come across no end of issues. That's why Concordia asked me to stay in Shadowfen and search for assistance." "A lack of food, an onslaught of bugs. Not to mention the fact that few are willing to travel through the wilds of my homeland. But I'm sure we can overcome these struggles! Especially now that you're here to help." "My homeland is very beautiful, but also very dangerous. Knifeberries, toadskin peppers, ghost truffles...these foods look very fine, but will kill most anyone who eats them. Without a guide, explorers can easily starve in the marsh." So what do you need to keep your explorers safe? "A copper-tongued skink! It's a lizard, you see? Specially trained to sniff out and eat any foods that explorers ought to avoid. Can you get one for me? A trapper named Arlowe Viducia should some for sale. You can find him in Sentinel." All right, I will go collect one of these lizards. He can then be further questions about the skink. So these lizards eat poisonous food but don't die? "Yes! Copper-tongued skinks put even the heartiest Argonian to shame. They can eat practically anything and survive. I saw one eat a whole bowl of throat-rake pears once. It just sort of fell asleep for a while, then woke up and ran off. Amazing!" Once you have obtained the Copper-tongued Skink, you can return to Jee-Lar to hand it over. Yes, I have your lizard. "Excellent! Oh yes, I can tell, this is a frisky one! Our explorers will have nothing to fear with this chubby little fellow along for the ride." "Our agents in Murkmire are always in danger of being bitten by some gross snake or spiky snail. We need to supply them with reliable curatives. Luckily, I know a brilliant Wood Elf alchemist named Mindileth. She makes a really good-good anti-venom!" And you need me to retrieve it for you? "She'll craft the curatives, but we need to provide the necessary components. Mindileth needs gloom morel mushrooms, a flask of barbleberry juice, and a few venom sacs from Scuttle Pit spiders. Take them to her at the Vineshade Lodge in Grahtwood. All right, I'll gather the components and deliver them to Mindileth. He can then be asked further questions about the anti-venom components and Mindileth. What can you tell me about the components you want me to gather? "Gloom morel, grows around Daedric sites. Check Gil-Var-Delle. As for the barbleberries, the grow also coastal regions. The venom we need is easily found in the Scuttle Pit, but not so easily collected, you see." Where do I meet Mindileth again? "She does her work at Vineshade Lodge, north of Haven. You will know she is there by the smell. It's awful-awful!" Do I need to stick around for her to finish the anti-venom? "Sort of? It's...the process can be a little complicated. Don't worry. She'll walk you through it." After helping create the Anti-Venom, you report to Jee-Lar to report your success. Mindileth is preparing your anti-venom. You could have warned me about the process. "What you didn't know didn't hurt you, and now we have the anti-venom. This payment includes a sum for non-disclosure of our trade secret. Your help is appreciated, as always." "We have a problem. Bugs. You see, the air in my homeland is often thick with swarms of biting insects. Luckily, I have made contact with a candlemaker named Tamira Dobar. Her products are guaranteed to keep even the largest bugs at bay!" "Tamira needs superior dreugh wax and ash basil leaves to create her candles. You can find both in Stonefalls. Once you gather the items, deliver them to her workshop in Davon's Watch. Bring me a batch of her candles, and be quick-quick!" All right, I'll gather the materials to create these candles. He can be asked for more information about the candles and Tamira. Can you tell me more about these candles? "I can only repeat what Mistress Dobar told me. I am no alchemist. But still, feel free to ask. What more would you like to know?" Tell me about ash basil. "Ash basil's usefulness as a repellent is well-known, but Tamira discovered a way to enhance those properties. So she tells me, anyway. Even the bugs of Murkmire will recoil from its stench! I hope." What exactly is superior dreugh wax? "Dreugh that consume ash basil seem to take on unusual properties. Namely, the secretion and buildup of a superior wax. A fortuitous coincidence on our part. This wax creates hardy candles, able to withstand the damp conditions of Murkmire." I'd like to know more about Tamira Dobar. "My conversation with her was brief, but I hear all kinds of stories. Apparently she likes to play jokes on her customers. This seems like a very strange way to business, but her products should be worth the aggravation. We will see, I guess." After gathering the materials and testing the Repellent Candles, you return to Jee-Lar to hand them over. Yes. Here are your repellent candles. "Well, that was quick-quick! Thank you, my friend. also want to thank you for handling Tamira. I hear she can be difficult to work with. But, as they say, an aged wamasu has the longest fangs. Wait, they do say that, right?" "Ah, the tasks are many and the workers are few. I told many adventurers about our expedition—about the great discoveries and constant mortal danger, but few agree to join us. Odd. Anyway, I am sure you will have better luck." "Visit the taverns in Mournhold, Stros M'kai and Vulkhel Guard. Post these handbills near the entrance to each. The trick is getting people to notice. If you put on these dancing leathers and perform an Argonian reel, that will get some attention!" All right, I will post these handbills and dance outside the three taverns. How will this dance help recruitment? "The Argonian Reel is a very popular dance in Murkmire and the traditional garments will attract the eyes. What adventurous spirit could refuse joining our expedition after such a striking display of our culture?" Are you sure these locations will be enough? After putting up the handbills and performing dances, you can report your success. I posted the handbills and performed the Argonian reel at all three taverns. "Yes I know! I've already received applications from several adventurers who watched your performance in Mournhold. Quite a spectacle, I hear! Thank you for all your help. Please, take this. Cyrodilic Collections grows stronger by the day!" "Gathering food in Murkmire is a dangerous proposition, even for Argonians. To keep our explorers robust, we have to ship in hearty food—salted meat mostly. It does not rot so easily in the dampness of the swamp. Our supply is short, however." So you need another source of meat? "Just so. I made contact with a reputable salt-maker—a Nord named Hervod—who can meet our demand, but he's no butcher. He did mention that the mammoth are plentiful in the Rift this season. Perhaps you could travel there and collect both for us?" All right. I'll gather mammoth steaks and get some salt from Hervod. Is mammoth really the most practical source? "We're sending meat in bulk, remember? Easier to throw five giant slabs in a barrel than butcher up twenty cows. Plus, they taste better!" Yes, I brought your meat and salt. But you've brought enough for one day! I hope this is adequate compensation." "As you may know, the weather in Murkmire can be nastier than a crocodile's bite. The last storm to hit our expedition set us back an entire week! We need an ally who can help us prepare, and that's a fact." "Priestess Hodyette. They say that the goddess Kyne has blessed her with the ability to see the patterns of storms, day before they arrive. Travel to Priestess Hodyette's camp in Eastmarch and implore her to help our cause." I'll visit Priestess Hodyette in Eastmarch and ask for her help. You think this Priestess Hodyette can really predict the weather? "I have heard many claims regarding the accuracy of her predictions. She is frequently sought out by farmers, sailors, and the like...perhaps a little too sought out." What do you mean, "too sought out"? "Priest Hodyette has quickly tired of her growing popularity. She's become a little...blustery? Make sure you tell her you can pay. That will at least get her talking!" When Priestess Hodyette has given you her predictions, you can tell Jee-Lar the news. Priestess Hodyette has given me a prediction. "I erect the spine of gratitude—ah, I mean, thank you, my friend! With such help, our expedition should be prepared for whatever weather Murkmire has in store for us!" He can be met on the museum floor of Cyrodilic Collections in Lilmoth. If you hadn't completed the prologue before meeting him, he will say. "These are the offices of Cyrodilic Collections. We're a society devoted to preserving Argonian antiquities, and that's a fact! If you're looking to help, you should talk to Famia. She sort of runs things here, oh yes she does." "Good to see you again! I'm so glad you decided to come to Murkmire, I really am! We could use your help, and that's a fact!" "Both Famia and Kassandra are impressed with you! From everything I've seen and heard, Cyrodilic Collections could use a few more explorers just like you. "So what do you think of Jaxsik and Xukas? They're the best of their tribes, and that's a fact! You better get moving though, if you want to find the Remnant fast-fast, before those Blackguard bastards." "You performed a miracle! A Hist has awakened and a new tribe has emerged from the swamp. It's enough to make my tail spin and spin! Thanks for aiding us in all these matters. I will always consider you a friend." What are you doing here Jee-Lar?" "Where else would I be? I go where Famia and Concordia need me, and right now that's right here. I'm cataloging the latest relics discovered by our explorers, and I need to be quick-quick! Look! I even found a place for the cursed skull!" "Oh, Concordia's off dealing with benefactors and recruitment back in the more civilized sections of Tamriel. Famia expects her to return soon, though, and that will be a good thing. The sisters work best when they work together." Was it really a good idea to bring the cursed skull here? "Where else should we put it? Oh, you mean the legend! I don't think the Golden Skull of Beela-Kaar poses any more danger to Murkmire. At least, not any more than usual. Don't worry, though. We'll keep the skull safe, I promise-promise!" What should I know about Famia? "Famia's a consummate researcher who's as smart as a sap-speaker. She's a little less sure-footed when it comes to field work, but she does much better when Concordia's nearby to help her. Some of our benefactors also help out, such as Kassandra. "As I said, one of Cyrodilic Collections' benefactors. She's wealthy, shrewd, competent. She might be the most competent Argonian I've ever met. at that's a fact! She's been quite instrumental in getting our current expedition off the ground." During the quest By River and Root, he will be attending the ritual within Root-Whisper Village along with other members of Cyrodilic Collections. If you completed the Murkmire prologue prior to this quest, he will be eager to hear of your adventures. "Hello-hello! So good to see you again! You must tell me all about your adventures alongside Famia. Were they exciting? Was there danger? I can't wait to hear every detail!" Jee-Lar wears the "Upriver" Striped Sash-Kilt costume. Jee-Lar participated in an in-universe Q&A (Part 1, Part 2) answering questions submitted by the community regarding Murkmire lore. This page was last modified on 7 March 2019, at 03:54.